The first white settlers in Davison County, according to History, settled in an area called Firesteel Creek. The year was 1871. Herman Cady Greene and John Head settled into the area that would become known as Davison County. A year later, 1872, Greene had lumber hauled from Yankton and built a frame house into which he moved with his wife Frances, daughter Louise and son Theodore. As other homesteaders came to the area they would gather in a developing community called Firesteel. At Firesteel, a railroad surveyor supposedly saw a piece of driftwood either lodged in a tree or lying on high ground along the creek. According to local legend, that was indication to him that the village was in a flood plain and therefore not suitable for development. However, evidence of the railroad company’s plans should have become obvious on May 5, 1879 when John D. Lawler, son of of wealthy bridge builder and Milwaukee Road stockholder, bought some 75 acres two miles west of Firesteel. Undoubtedly he had inside information because his land just happened to encompass much of the site of a new town to be named in honor of Alexander Mitchell, Scotland born president of the C.,M & St.P. and business associate of the younger Lawler’s father. In 1881 the territorial legislature met and considered two bills redefining the boundaries of earlier hastily created counties. As a result, the residents of Hanson and Davison were faced with two choices. The first was to combine the two retaining only the Hanson name, the second was to split them down the middle, after adding four townships on the west, creating, in effect, twin counties of 12 townships each. The people would decide, in a vote, for the latter of the two. The results were especially influenced by the voters of Mitchell and Alexandria, both county seats and one of which would lose the political plus if a single county was formed. Just who originally applied the name Mount Vernon to the former Arlandton has never been established, although it may have been a Virginian or someone who had memories of George Washington’s estate. The town plat was recorded in 1882 at about the same time John Pease established “The Mount Vernon Gazette.” By the following year a hardware store, livery stable, lumber yard, drugstore, cigar manufacturer, hotel and several other firms were in business. Much like the communities of Mitchell and Mount Vernon, the survival of Ethan was largely due to the railroad. For three decades, Mount Vernon’s “Old Settlers Day” was the highlight of the town’s year. People came by train, horse and buggy and finally the first sputtering automobiles to enjoy the gala celebration. There were band concerts, shooting matches, greased pig chases, literary recitations, baseball games, parades, speeches, fireworks and a grand ball at the Opera House. First introduced in Mitchell in 1892, the above picture shows the “world’s only Corn Palace”. It’s face may have changed many times but the Corn Palace still draws hundreds of thousands of visitors to Mitchell each year. 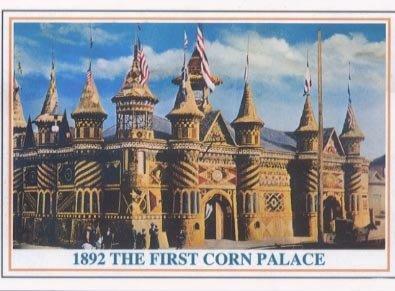 The Corn Palace is currently under major construction, which includes new domes, lobby, and gift shop.